MADELINE WEISBURG: I’d like to start at the very beginning of the book design process. When you first hear about the concept for an exhibition, what sort of research do you do? How do you relate the aesthetic vocabulary of an artist, group or movement to the design of a book? ANDREA HYDE: The research I conduct at the start of a project is tailored to the subject in question. For previous publications I spent time with living artists, researching the subject in person. 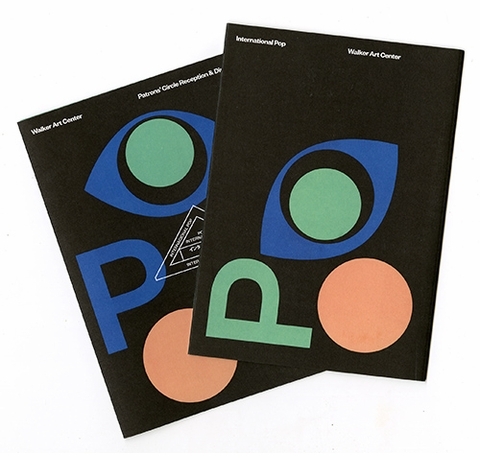 In this case, after I learned that I would be designing the catalog and identity for International Pop, I began frequenting the Walker’s library, reviewing our considerable collection of Pop-era ephemera, artists books and catalogs. Then throughout the book design process, I adjusted my research strategy depending on what was needed, what was missing from the project and what I needed to learn. The translation of artistic vocabulary into a book is context-specific, and ranges from a slight nod to a more literal reference. Pop has so many visual signifiers that it would be difficult to avoid calling them out in this book, even in subtle ways—like the choice of typeface or the style of the contents page. 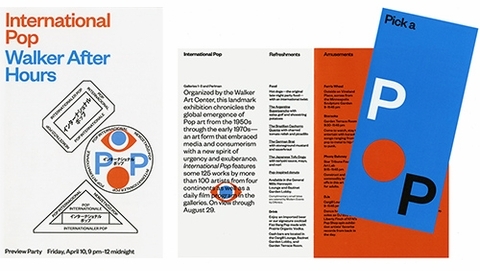 ABOVE: Ephemera from the Walker's International Pop campaign. Is it unusual for the book designer to also design the identity for an exhibition? It may be unusual for other organizations, but at the Walker designers are assigned specific exhibitions, performances, screenings or programs, and handle everything from concept to delivery themselves. So for each of the books I've designed at the Walker—Eiko & Koma, Lifelike, 9 Artists and International Pop—I've handled the exhibition identity as well. Is your approach different for historical group surveys like International Pop, as opposed to monographs? Definitely. 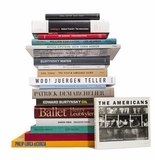 Monographs are different, in part because it’s easier to get to know a singular artist—even posthumously—than it is to channel a movement or the conceptual arguments behind a contemporary group show. Artists who are the subject of monographic catalogs often have large bodies of work, and critical writing about said work, all of which provides an immersive experience for the designer, from ephemera to previous publications and essays, artist statements and distinct artistic periods. 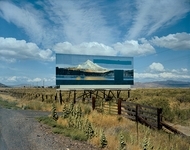 In contrast, the curatorial ideas behind a group show can be difficult to convey, in part because those ideas often present new ways of thinking about art, and also because the visual language needed to put those ideas forward has to be invented a priori, without the benefit of a specific artist to inspire the process. Contemporary group shows are more abstract. But that being said, there is a certain freedom in defining a new idea, of being beholden not to an artist, but a concept. In the case of historical surveys like International Pop, the approach I take is somewhere between the monograph and group show, in that an artistic movement like Pop functions as the artist. The resulting book identity is not inspired by one artist or one group of artists, but by Pop-at-large, reimagined by myself and my colleagues. 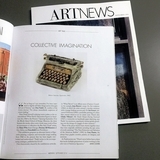 ABOVE: Erró, "Foodscape" (1964); Carlos Vergara, "O General, (The General)" (1965); (left) Eduardo Costa, "Fashion Fiction 1: Vogue USA, Feb. 1, 1968" (1968) and (right) Jorge de la Vega, "Billiken" (1968). Which designers or artists do you look at for inspiration? I have stopped looking at specific designers for style inspiration, as, when working on art books, there is usually abundant visual material from which to drawn upon. I look to other designers for the way they think or the way in which they work, or how they’ve managed to make a living for themselves. Although, of course there are exceptions, and I do find myself admiring specific designers or artists for one reason or other: Irma Boom as the quintessential book designer; Maureen Mooren for her beautiful form and posters; Hort for their mastery of typography and branding; Maurice Scheltens for still-life photography; Karel Martens for the design legend he is; Jean Luc-Godard for his amazing intertitles; Slavs and Tatars for their prolific multi-disciplinary practice; artists Wanda Pimentel, Kerstin Brätsch, Lesley Vance, Vija Celmins, Lorna Simpson and infinitely more. As an object, International Pop is incredibly striking. What was your guiding principle behind the design of the package? This project required high production values to match the importance of its contents. I didn’t set out to make a book that felt expensive per se, but I did push for little nuances to make a book that felt more visually tactile and impactful as an object. The book was printed at die Keure in Belgium, which was instrumental in realizing the project, as was our image specialist, Greg Beckel, who corrected the book’s illustrations and plates. ABOVE: Press check at die Keure in Brugge, Belgium. Matching proofs to press sheets. BELOW: Uncut sheets before they are cut and sent to the bindery. Wow! I know that die Keure is considered to be one of the best printers in the world. What makes them so special? I had wanted to work with die Keure for many years, but did not have the opportunity until now. They are truly masters of their craft, and the best designers from all over the world work with them. Although they don't print with UV ink, their printing is incredibly sharp and their pressmen have an amazing eye for color. The foil stampers and binderies they work with are outstanding. Throughout the printing process, I felt that I was in expert hands. Speaking of the binding, I love the puffy cover. How was this made? The puffy cover was something I advocated for because I thought that it added to the unexpected but luxe feel of the book, and I associate Pop—rightly or wrongly—with a kind of soft friendliness. 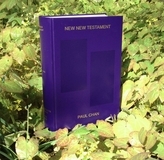 The book board is padded before it is wrapped with the book cloth to achieve the puffy effect. Where did the concept for the cover graphics come from? Thanks. From there, I created a suite of passport stamps to serve as the International Pop brand. 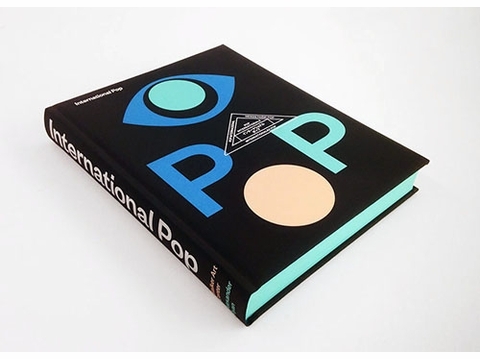 In each version, International Pop was translated into the languages of the artists who were heavily featured in the show and essays, which detailed Pop movements from around the world, from Brazil to Japan. I’m also curious about the color scheme that you chose. When I first saw the book my personal association with the teal printed edges was with the color of a popular brand of photo emulsion for screenprinting, which seems so perfectly suited for a book about Pop. What informed your color decisions? Although the screen printing reference would have been a clever one, the color scheme was a happy coincidence. Initially, I sketched the cover and other elements of the book with primary colors on a white background, much like Lichtenstein’s "Look Mickey" featured in the show. But I needed to move away from that knee-jerk reaction, which made more sense for the Walker’s International Pop campaign than it did the catalog. Curators Darsie Alexander and Bartholomew Ryan set out to redefine and broaden the scope of what most people think of as Pop with this exhibition, and that included color. So in the spirit of experimentation, I opened a few sketches in Photoshop and inverted them. The white background became black and the primary colors were altered; I continued working with the same palette going forward, including the fore edge stamping, which is meant to match the turquoise graphics on the cover, as well as the pages I call “interruptions”—snapshots taken by the curators over the course of their travels and research that are dispersed throughout the book. 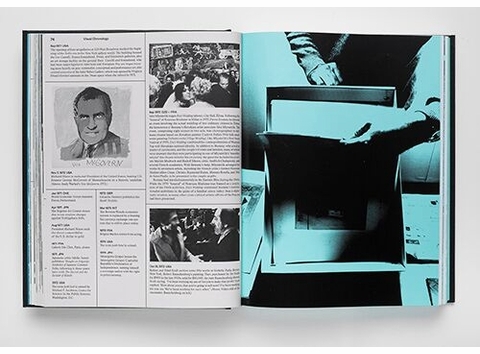 The catalog starts with a detailed visual chronology, which charts key events surrounding Pop internationally—political, economic and explicitly art-related. Instead of functioning as an appendix, this section grounds the rest of the book. Can you talk about the thinking behind the design of this section? Darsie Alexander and Bartholomew Ryan had already planned for an extensive visual chronology by the time I started the catalogue. They worked with local art historian Godfre Leung, who had the massive task of identifying, organizing and writing about the relevant and tangential events, movements and watershed moments that contributed to the evolution of Pop. The chronology is formally based on scaffolding, which has the effect of compartmentalizing each entry. It was important to control the chaos of the hundreds of dates, texts and images in the chronology with a strict system to ensure the reader could make sense of it all. 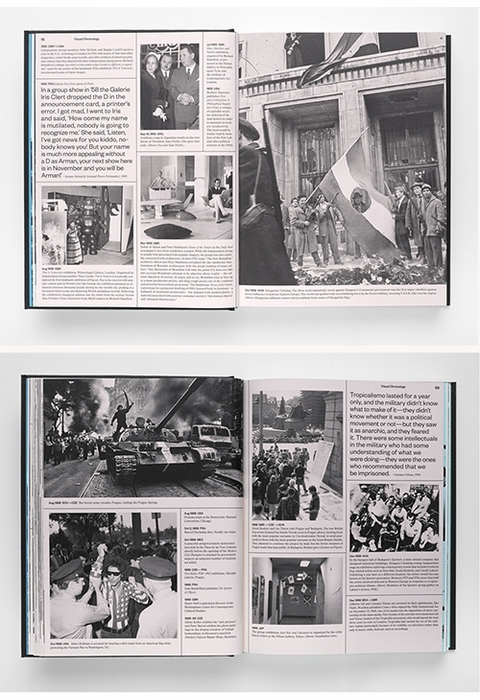 As most of the archival images we found were black and white, I decided to make this section one-color to contrast with the four-color work featured throughout the rest of the book. 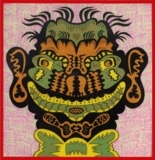 ABOVE: Godfre Leung's visual chronology of events surrounding global Pop art, 1944-73. I spent a lot of time with this section of the book. It's fascinating. For the chronology, the artists’ voices were as important to me as the photographs. So I treated the pull-quotes similarly, in that they stood out on the page—they are displayed larger, in a different typeface from the entries (Founders Grotesk), and were given their own “compartment” on each spread, which allows the reader to engage with this section from either the cursory level of quotes and images, or the deeper level of entries and captions. And because international travel was a relatively new and exciting reality at the time, I called out each event by noting its international country code(s), at times listing two or more countries depending on the item, and noting artists’ movements, international agreements and the like with arrows. Finally, even though the chronology is the entry point to the rest of the catalog, it is intentionally stylistically separate. So we printed it on a different, salmon-colored paper à la the Financial Times. I read an interview with you on the Walker blog where you made a distinction between designing art publications that feel like artifacts and those that feel like documents, in reference to production value. These definitions seem incredibly important for the book designer. Can you expand more on this? Yes, I think designers are often in a position where they need to prioritize and focus their efforts. In some casesdepending on timing, budget and manpower—it makes perfect sense to provide a document of the subject matter meant merely to glance at, maybe read, and in time discard. Publications that seek to be a definitive resource have a higher standard. They need to be appealing on several different levels, production value being one. 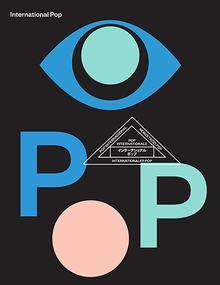 As I mentioned before, in response to your question about the “objectness” of the book, International Pop needed to feel like an artifact, and the permanence of the book as an object helps the ideas within it feel permanent as well. 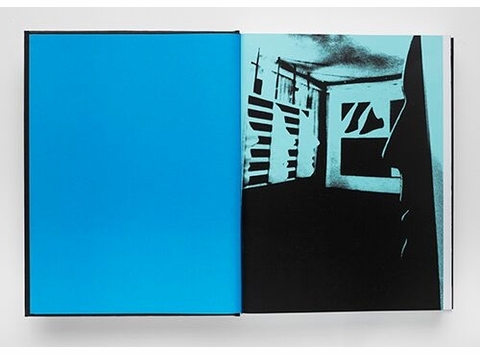 The book does a great job of presenting the work from the Walker show, but it can also stand alone as resource. How do you address the challenge of making a book a platform for the material and not a walkthrough of the show? Unlike digital media and design for the web, print has a built-in finality that puts the book in a unique position to be an authority figure, the “final word” on a given topic. Depending on the curator or editor’s motivations for a publication, I can either highlight that sense of authority or I can underplay it. In the case of International Pop, the subject matter was so extensive that there was never a thought that this catalogue would merely document the show. In fact, there were a number of artworks that we included in the plate section of the book that, for a myriad of reasons, did not make it into the show. Apart from that, essays by curators and contributors added such richness to the subject that it far surpassed what any audience could hope to experience in the gallery. Are there any radically different approaches to the catalog that you ended up not taking? “Radically different” is a pretty high bar, but I did have alternate approaches that were abandoned for one reason or another. The “interruptions” throughout the book went through a number of incarnations. They were originally intended to be the stylistic glue that held the book together, presenting another layer of content in a more explicit manner than you see in the finished book, where I present the curators’ snapshots from research trips in a similar high-contrast style on glossy turquoise paper. 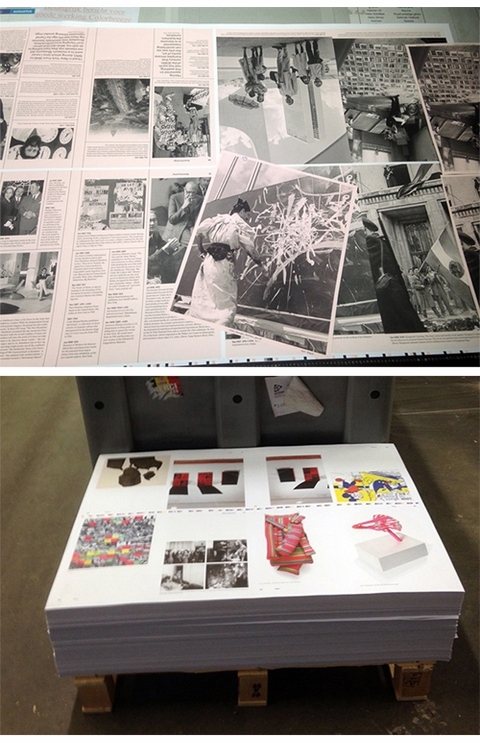 The printed book is less aware of itself, and a better thoroughfare than what I initially presented, where the divider spreads would 1) foreground exhibition titles and texts written during the Pop period (But Today We Collect Ads and Parallel of Life and Art were two favorites); 2) feature newspaper tear sheets representing the regions and events in the show; and 3) provide an extension of the rebus system on the cover. ABOVE: A glossy "interruption" page opens the book. Any upcoming projects that you’d like to mention? Currently, I’m designing an exhibition identity for Jack Whitten, who will be at the Walker in September for the opening of his touring show. I will also likely design the Walker’s upcoming Merce Cunningham book, which will be another big, International Pop-level undertaking. And then apart from my work at the Walker, I have a number of freelance projects that keep me engaged, although I will wait to talk about those chicks after they hatch. ABOVE: Another "interruption" page closes the matte pink visual chronology. ANDREA HYDE is a designer and art director based in Minneapolis. After studies at the Minneapolis College of Art and Design, she worked for boutique New York studios like Design MW, whose mix of cultural and corporate clientele presented her with a variety of design challenges and solutions, the latter of which have been featured in Print and ID magazine. Her current role as senior designer at the Walker Art Center has continued to afford her with opportunities to engage in diverse and award-winning work, including a 50 Books/50 Covers award. Her freelance practice ranges from graphic design, art direction, typography, copywriting, to installation for individuals and institutions, especially within the fields of art and culture, fashion, music, and luxury.